Is steaming the best way to cook food? For years the steaming debate has raged on, with many health experts claiming that steaming food is a far healthier way of cooking it than conventional methods. Steaming works by continuously boiling water, which gives off steam and cooks the vegetables either in a steamer or in a colander above a boiling saucepan. Here are the benefits of steaming that could see you throwing away that frying pan and baking tray for a new, healthy lifestyle. When food is steamed there is no need for oil, something regularly used when frying or oven cooking. This means there is immediately a lower fat content than food that has been cooked in oil or butter. When frying, boiling, grilling or oven baking, it is a lot easier to burn or overcook food than when steaming. On steamer machines you can also normally set a timer, ensuring the food cooks for only the required time. 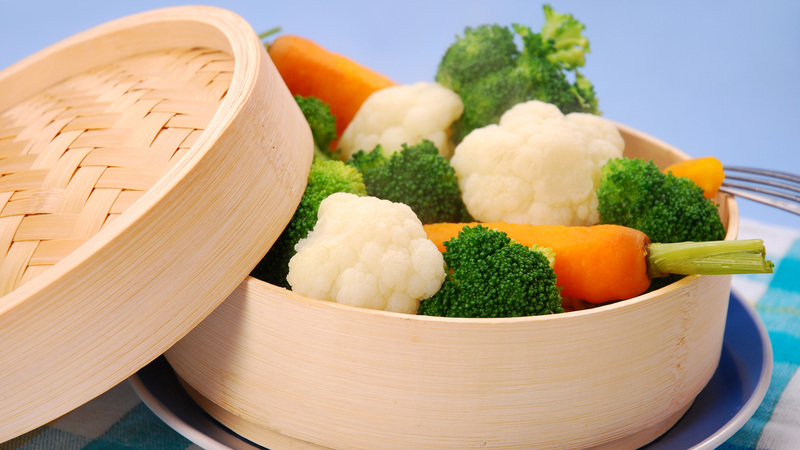 Vegetables normally need no longer than five minutes to be steamed thoroughly. Several types of food can be steamed at the same time with no contamination. This can reduce time and the amount of washing up! When vitamins such as vitamin C, which is required for essential metabolic reactions in the body, and vitamin B, which promotes healthy neurological function, come into contact with boiling water they can be damaged. According to several studies, steaming results in far less damage to these nutrients, leaving the food with a higher vitamin content when eaten. Many vegetables, including broccoli, cauliflower and cabbage, have cancer-fighting components, called glucosinolates, which are destroyed when over-cooked. By steaming them at low temperatures and using only a small amount of water their amazing compounds are retained. Boiling and microwaving vegetables can damage up to 60 per cent of the nutrients and glucosinolates, so their nutritional value falls dramatically. The secret to steaming food is to make sure there is enough heat around the food. If not, the food may be undercooked. However, if too much heat is present the food may turn rubbery. In a single-tier steaming machine or a colander set above a saucepan of water, place the food so there is space around each item and the steam can therefore circulate effectively. Be careful not to over-load the steamer or to stack the food as cooking will be uneven. Use only a small amount of water in the base of your steamer – 1 cm. should be fine as you do not want it anywhere near the food. Close the lid tightly over the food, and do not lift the lid once you have started steaming your food or it could hinder the process. Parboil all grains first before finishing off the cooking process by steaming.